A holy grail in the world of rookie cards. Oh boy! This is one of those rare offerings that requires a double-take to ensure it's indeed real and not a figment of one's imagination. 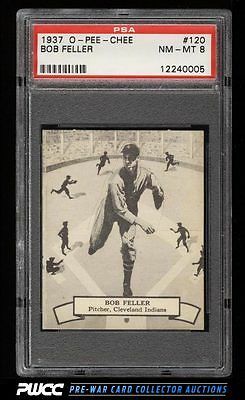 Up for bid is indeed the real deal, a 1937 OPC Feller RC in an impossibly rare PSA 8 state of preservation. One of only two such examples in the hobby and a wonderfully strong example at that. virtually MINT surfaces and edges with great print and contrast. This card is special, simple as that. We recommend this as highly as any pre-war card we've sold in recent times. Awesome. One of nearly 20,000 cards, lots, and sets up for bid in our 7th Auction of 2016. Click on the link above to view the other PWCC auction lots.